A Disney movie set in 1764 opens with the English Royal American Regiment led by Col. Henry Bouquet down the Ohio. The Delawares were so impressed that they sent their most important chiefs to meet with him. Chief Cuyloga : (in Delaware translated by Del Hardy) : With this belt I open your ears and your heart. It is the will of the Great Spirit that there should be peace between us. Col. Bouquet : You speak of peace, but murder our people on the frontiers. Chief Cuyloga : Our cousins the Conestogas believed the white man and took his religion. Then the white men from Paxtant came with guns and hatchets. Col. Bouquet : What does he mean by Paxtant? Chief Cuyloga : They murdered in cold blood helpless Indian women and children. The white barbarians scalped them and did indecencies. Col. Bouquet : The Paxon Boys were cowards. They were afraid to fight the Indian warriors, so they killed the women and children in the dead of night. But I come to you in the broad daylight to speak to you face to face. And i tell you that no white man will settle on your lands beyond Fort Pitt. And I will give you another promise. Neither the Paxton Boys nor the other hot heads on our frontiers will kill any Indian unless you attack them. Chief Cuyloga : What promises does our white brother ask in return? Col. Bouquet : That every form of treaty you have promised not to murder our people and you have promised to deliver up all your captives. Now if you want war you may have it but if you want peace you must deliver in to my hands all the whit prisoners in your possessions. Chief Cuyloga : We will put fresh earth to the roots of tree of peace so that it may live and flourish while the sun shines and rivers runs. True Son, adapted son of Cuyloga does not want to go back. Cuyloga says he must go so the Indians may live in peace. The Delawares bring the sad captives in to the English camp. True Son tries to eat some poison roots on the march to Pennsylvania but Del Harris (Forrest Parker) stops him. Half Arrow, True Son's cousin then joins in the journey to keep his cousin company. Half Arrow tells True Son that his father told him to try to get along with the whites. He tells him: "Your father sends you a message. These are his words. Remember what happens to the white prisoners that the Indian takes. If he bears his hardship with patience his Indian master likes him, but if he fights back and complains there is nothing else to do but to scalp him." When they reach Fort Pitt Del makes Half Arrow leave. At the fort, Harry Butler claims his son, Johnny (True Arrow). Del Harris rides along with the Butlers back to Baxter township. Col. Bouquet is afraid of what the Paxton Boys might do. Before you know it Johnny settle in and falls for the servant girl, Shenandoe. Then Half Arrow and Little Crane come looking for Johnny. White men shot at and killed Little Crane. Then Half Arrow clubs the leader of the Paxton Boys. Johnny heads off with Half Arrow back to the Delawares. When they get back to the village True Son tells his father he could not live with the whites. The Delawares dance the war dance over Little Crane's death. Chief Cuyloga tells Little Crane's brother Niskitoon that they should not break the peace. The Council decides with Niskitoon and the Delawares go on the war path and before you know it they have 15 scalps, some from children. As settlers come down the river True Son tries to get them to come to shore so the Delawares can attack them. As them come close he warns them of the ambush. Johnny is not a man without a tribe. The council votes that True Son is not a Delaware. Cuyloga speaks for his son before he is burned. Cuyloga saves him but tells Johnny that he is no longer his son as he sends him back to the whites. Johnny comes back with Del to face Wilse Owens who killed Little Crane. Johnny and Wilse fight. After a slow start Johnny wins and Wilse says "He's white alright." 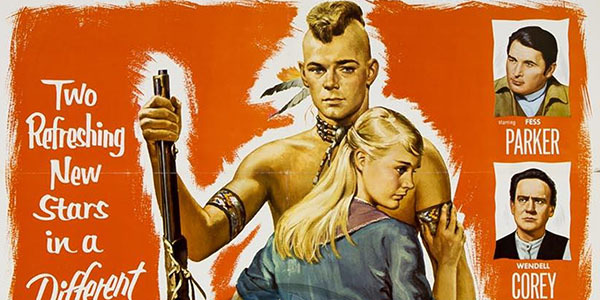 A sympathetic, but simplistic, look at the Indians with the standard bad white guy. At the end of the movie Johnny runs off with the girl to the waterfall.